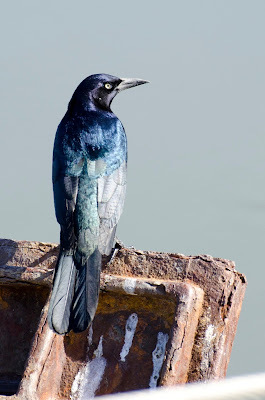 The common grackle, Quiscalus quiscula, is about a foot long, appears uniformly dark from a distance, and has bright yellow eyes. Up close it is all glossy iridescent purples and blues, and very pretty. Click to enlarge. 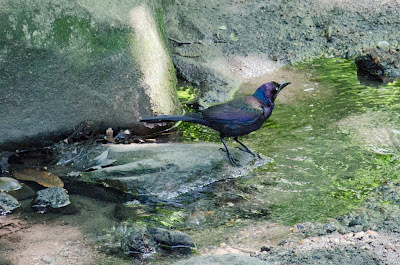 Common grackles stay in New York year round. I saw one the other day, striding around on its long legs and looking cocky. Whenever I see one I take a moment to admire its glossy colors. I usually see a single bird in a park, or just a few at a time -- they look innocent and pretty. But I hear that they get up to no good outside the city limits. They descend on corn and rice fields every year in huge flocks, eating everything in sight, and collectively causing millions of dollars worth of crop damage. And in winter, they sometimes join other birds (starlings, brown-headed cowbirds, and red-winged blackbirds) to forage and roost in noisy flocks that can include thousands of birds. That's usually very unpopular with the humans they sometimes settle near. 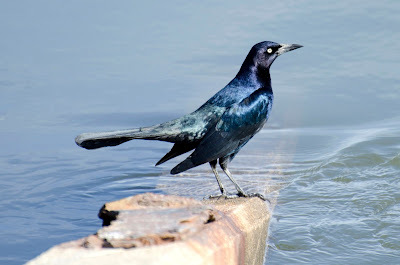 Grackles are also seen by many as bullies at bird feeders, driving other birds away and quickly eating every last scrap of food. That does sound rude. I think I prefer my polite New York City grackles.